“Well developed” is a requirement of the U.S. No. 1 grade for “other berries” (raspberries, dewberries, and blackberries), “not undeveloped” is the requirement for the U.S. No. 1 grade for strawberries. Berries that are misshapen or have not attained a normal shape and development due to Anthracnose injury, frost injury, lack of pollination, insect injury, or other causes shall not meet the requirements of well developed (other berries) or not undeveloped (strawberries) as required in the standards. If you still use the USDA to perform some inspections, the inspection certificate may not report the term “misshapen” as a defect. Some USDA inspectors may refer to misshapen strawberries as being “poorly developed” or “not well developed.” As you can see from the inspection instructions above, the USDA never uses the term misshapen. But feel free to use the term “misshapen” on your own inspection reports as everyone in the industry will recognize that terminology. Misshapen strawberries are a quality defect, meaning the misshapen will not become worse, or “more misshapen.” They do affect the marketability of the strawberries, as consumers are looking for fresh, bright strawberries, uniform in shape and size. As a guideline, the USDA has created this official visual aid. 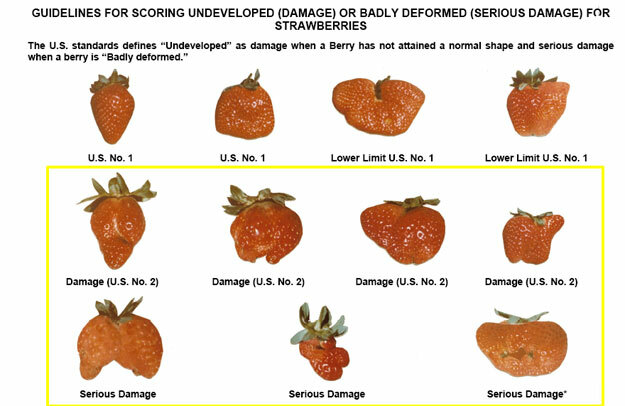 The two, highlighted rows depict strawberries that are misshapen, and would be scored as defects against the U.S. No.1 Grade. Looking at the strawberries on the top row you can clearly see there is some generous leeway regarding misshapen, or poorly developed strawberries. All the strawberries in the top row would meet the requirements of the U.S. No.1 Grade. 2 strawberries with bruising, and 2 strawberries being misshapen, you would have a total of 4 defective strawberries out of a 20 count sample. 4/20= 20%. Since you are only allowed a tolerance of 10% defects, your sample would be out of grade.